The renowned electro-acoustic composer, Luc Ferrari, came up with the musical concept of “Presque Rien.” On first seeing these two simple words in the 70’s, the idea of music made from “almost nothing” appealed to me tremendously. This was in the time before the internet, so it took me quite a long time after reading about it, to actually get to hear some of this work. I was imagining that Ferrari would use tiny sounds played on spare instruments, but in fact he was mainly working with natural sounds (the first “Presque Rien” consisted of a day-long recording of sounds at a beach, edited down to 21 minutes). I imagined a man of tremendous patience, painstakingly assembling these delicate soundscapes. 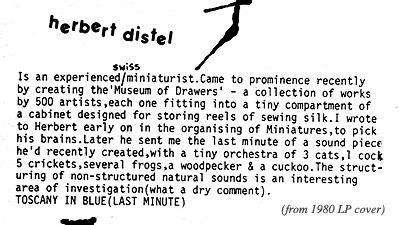 How much patience, then, must Herbert Distel possess, to have created his Museum of Drawers, with the staggering number of 500 artists and artworks to deal with? This huge collection includes tiny works (largely from the 60’s and 70’s) by such luminaries as Picasso, Joseph Beuys, John Baldessari, Carl Andre, Chuck Close, Tom Phillips, Nam Jun Paik, Edward Ruscha, Dieter Roth and John Cage (to name 10). It makes Miniatures seem puny by comparison. Herbert worked on it for 7 years and by 1977 it was complete. Two years later I started work on Miniatures and knew that I had to have Herbert on board. I recall that it was through the ICA that I found him, and we exchanged friendly letters, the pioneer encouraging the newbie to go ahead with his lesser project, for which I am grateful. Herbert, like Ferrari, was and is fascinated by natural and man-made sounds, but his miniature piece is more akin to a sonic mosaic, with various short animal, insect and bird calls repeated and layered. Tape loops, I would imagine, as this was before samplers were widely available. On relistening to this track after a gap of some years (and on much better equipment) I must say I am impressed with how Herbert has managed a continuous crescendo over the entire minute. I have tried something like this and I always seem to run out of fader, by getting to the max far too soon. Somehow Herbert has managed to build both the volume and the tension slowly but surely, quite a feat, in my book. Our paths crossed in 1982 when I was travelling in a world far removed from the heady experimentalism of Miniatures. I was playing keyboards on tour with Queen, and as I travelled around Europe as part of this showbiz extravaganza, I made use of the days off to contact various friends and acquaintances in each city. We hit Zurich in April, and Herbert welcomed me into his home with bearded warmth, fine home-cooked food and wine and a cosy family atmosphere – a delightful contrast to the fancy hotels we were staying in. It turned out his daughter was a Queen fan, so she joined me the next day at the show, the roadies and backstage staff treating her like a little princess. The concert she enjoyed (and I played) could hardly be further away on the musical spectrum than her father’s minimal textures. If variety is indeed the spice of life, I must be a herb tycoon. 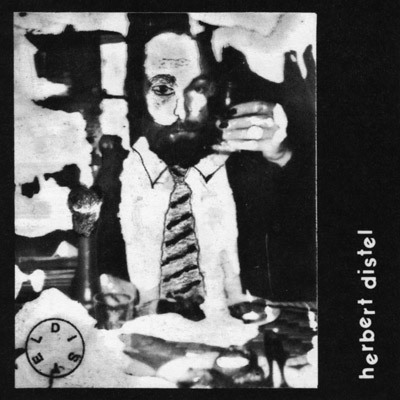 Distel’s first sound art work was the LP “We Have A Problem” (1971) based on NASA recordings of Apollo 13 astronauts that were mixed with a live rendition of George Gershwin‘s ‘Rhapsody In Blue‘ as played by the pianist Peter Aronsky. Thank you Herbert for inspiring me, and for your hospitality. Long may you continue your creative, head-turning, mind-bending endeavours!